25 January slogan: "The People, the Army: One Hand!" Mubarak has stepped down and the Egyptian people have triumphed, celebrating as only they can. But have they really triumphed? Is the regime gone? Obviously there will be many remnants. What will become of Mubarak and Omar Suleiman? What will become of the police, the Mukhabarat's apparatus of detention and torture? What can save the economy of a nation that has such demographic problems? These are certainly very real worries. But foreign, particularly American, observers are partly irrelevant now, though they could be helpful. Obama, whose foreign policy team was at cross purposes and who vacillated* himself, has come out with very positive statements about the revolution, its youthful spirit, its new hope -- a move, at last, that's both wise and shrewd on his part. But this has brought the ire of such right-wing US foreign policy ideologues as John Bolton, a would-be republican presidential candidate, who has raged at Obama's naiveté. Here is one of the reasons the American right is so clear and forceful in its statements. Its spokesmen repeat the same ideas over and over without reference to changing events. Conservatives stick by their two familiar bugaboos, the Egyptian army and the Muslim brothers, whose predicted effects are somewhat contradictory, because the army, they say, will make everything remain the same (which they may like); but the Muslim brothers, they also say, will change everything horribly for the worse. To begin with, conservatives don't like revolutions: full stop. The armed forces are a great power in Egypt. They are in charge now. Besides, since 1952 each leader has come from their ranks. But the military has stood on the side of the uprising and this has been clear all along. A slogan of the protesters all along was "The People, the Army: One Hand!" The army must have supported the removal of Mubarak for that to have taken place. Bolton and other conservative commentators and "experts" (whose Middle East experience Jeremy Scahill joked often seems to be "has eaten falafel") keep insisting that the Muslim brothers are a mass of jihadists. Everyone knows the Ikhwan are the "most organized" opposition group. But their threat seems exaggerated. They have become more moderate and open to secular government. They have been warmly cooperative in the intifada, never impeding its Muslim-Christian unity. They may simply not be much of a political force in Egypt now, if they ever were. As has been pointed out, they have accomplished little in the last eighty years. The youth revolution of 25 January brings out whether one is an optimist or a pessimist. I side with the optimists. They include most Egyptians right now. They see a new, young, secular democracy, with free elections, economic development for the good of all, and representation of all elements of society. The pessimists say there will always be a "pharaoh," and the army will just bring in a new one, maybe even someone not so new. They go on to say Egypt will go the way of Iran rather than Turkey. Optimists like me point out that the Egyptian people have an incredible new commitment to their political future, an extraordinary new sense of civic and national pride that make everyone want to get involved -- and ready to take to the streets again if their basic demands are not met. The touching voluntary cleanup of Tahrir Square is a visible metaphor for their will to cooperate at the most basic level. 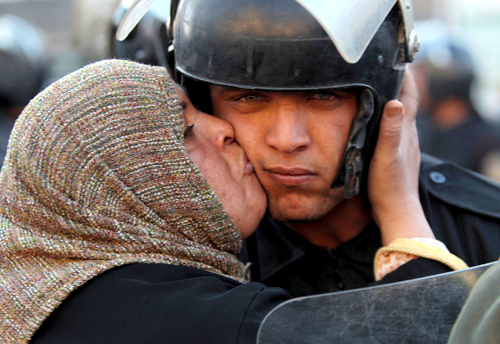 The spirit of Tahrir Square won't easily be abandoned. This may be a time for Americans to acknowledge that it's not all about us or all about Israel. Even moderates have dared to speculate recently that propping up a dictator like Mubarak for thirty years may not really have done either the US or Israel any good. A lot of those billions went down the drain. They may have gone directly into the Mubarak family bank accounts. They certainly didn't go into the pockets of Egyptian working people. The fourth communiqué of the High Council of the Armed Forces is encouraging as far as it goes, pledging a changeover to a civilian government and continuation of all existing treaties. The people and their various political organizers are agreed on the general steps that must soon take place. Both houses of parliament must be dissolved; there must be a new provisional constitution allowing for true democratic elections; a presidential council and a transitional government; a referendum on a new constitution. There may be differences on details. Some may be unhappy that the military is in charge. Everything hinges on what elements of the army dominate. For the moment there are no clear leaders. For me this is hopeful too, a clear sign that this is really as Al Jazeera Arabic has called it, ثورة شعب/thawrat sha'b, "a revolution of the people." But in a situation like this, we have to be able to live with uncertainty. *See "Obama on Egypt: a retrospective" by Ken Willet on The Faster Times, http://thefastertimes.com/politics/2011/02/13/obama-on-egypt-a-retrospective/.